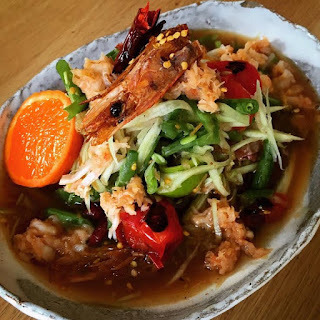 On May Day Bank Holiday - Monday 2nd May - Sebby Holmes Farang London is popping up at San Daniele in N5 for a Thai lunch. I went to the one on Easter Monday, and so I can't recommend this enough. It's great value at £28, so email Sebby now to book your tickets. Full details below. "It's pop up time again. Farang is taking over the San Daniele on the May bank holiday Monday (02.05.2016). Please find attached a brand new menu that the kitchen have been working hard on, this is not one to miss. We are doing one sitting at 15:00 which will last around two hours but diners are more that welcome to sit back and enjoy their table for as long as they want (it is bank holiday weekend after all). We're serving four courses for only £28, including sharing curried crab and smoked salmon 'mi krob', a perfect way to spend your bank holiday Monday. To see in the Thai new year we are also offering a range of Thai wines from Monsoon Valley wines and of course Ice cold Chang beer."